You are here: Home / *Articles of the Bound* / Debate 3: Obama Channeled President Richard Nixon? Last Monday night was marked by one of the weirdest continuing expressions of disdain and anger that I had ever observed from an incumbent US ‘president’ toward his opponent candidate. The visage locked into Obama’s face was one of derision and contempt for Governor Mitt Romney who–despite prodding from both Obama and moderator Schieffer–had refused to fall into another tag-team trap on Libya. Each time Romney refused to take the bait and instead relayed Obama‘s failures to our country in multiple areas, Obama’s facial demeanor became angrier and–with each passing moment–seemed more unstable. Note: Yes. I would have appreciated watching soon-to-be President-elect Romney tear Obama asunder over the seemingly planned deaths of 4 Americans in Benghazi. However, as the debate progressed he did so in other areas…and quite artfully. I believe his strategy worked. 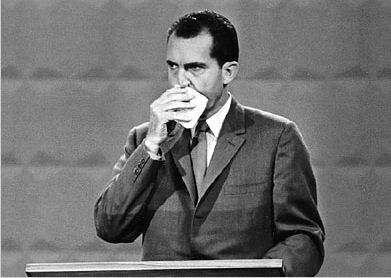 The thing that struck me the most about Obama’s performance in the third presidential candidates’ debate was that Obama seriously looked and–during large portions of the debate–seemed a bit unhinged. He actually looked and sounded like a thoroughly unqualified and ill-prepared candidate to Romney’s presidential demeanor. This performance was truly “non-optimal” for any US president. And, by the way, watch Nixon’s and Obama’s eyes in the provided videos below. The expressions seem to be identical and I have to wonder when Obama will be forced–if ever–to give his own “I am not a crook” speech. I, for one, hope and pray it’s soon.